Estimates are that over 100 million people (broadcast television and streaming combined) tuned into the Presidential Debate on September 26, 2016 – the largest viewership ever of a debate, and one of the largest television audiences ever. In the week following the debate between candidates Hillary Clinton and Donald Trump, several parts of the debate received focus by the candidates themselves and the media, including Trump’s bizarre denigration of one individual woman, the issue of paying taxes, and Clinton’s need to explain her positions on trade. But one part of the debate stood out to me so clearly and yet it has barely gotten mention: Implicit Bias. This is a crucial issue for us as educators and as a country, especially in these increasingly conflicted times. Her answer reveals a lot about her long work in social justice and her ability to understand that this issue is not just about police, but about all of us. Some of the most important work around implicit bias can start with teachers…and not just in the classroom, but before they reach the classroom. Teacher training programs, and then consistent Professional Development needs to not only focus on implicit bias, but also teach how to overcome it, and how to model overcoming it to our students. First, let’s define implicit bias. It is different from explicit biases: those are biases or stereotypes we know we have, perhaps influenced by our parents or the society in which we are raised. It is not difficult to examine our explicit biases because we can recognize them in ourselves. But our implicit biases exist below our conscious mind, beneath our regular thought processes. Implicit biases are the prejudices inside our minds that we don’t recognize are even there unless we make an effort to really discover them. An educator’s implicit biases can be severely detrimental in the classroom, and studies have shown that gender favoritism, racism, sectarianism, and other biases can emerge in the classroom even when the teacher is unaware of it. Harvard has been conducting an implicit bias study for many years, called Project Implicit. They offer a series of quick tests you can take on a number of issues: disabilities, race, weight, skin tone, gender, age, weapons, sexuality, and many more. 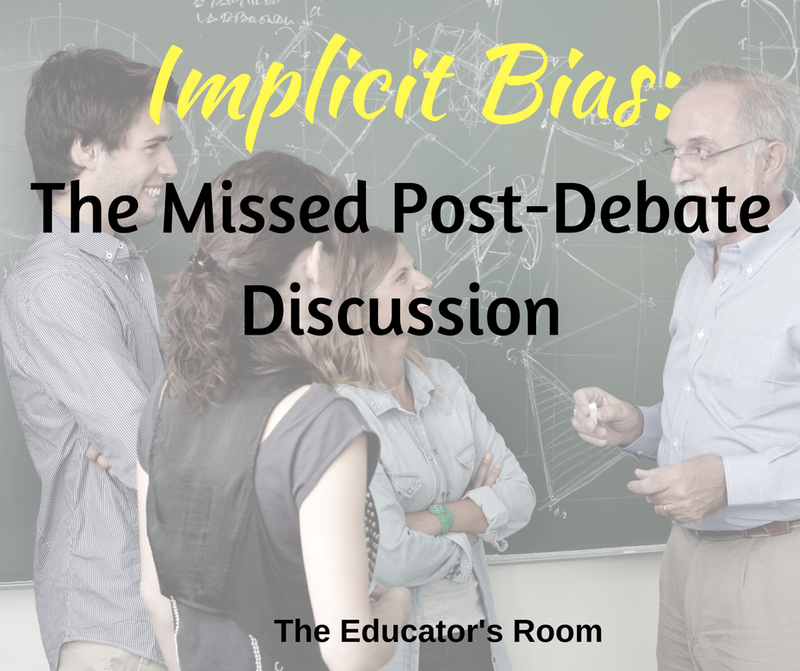 You might want to take a look at some of these and see where you stand with your own implicit bias on these issues – starting with recognizing our own biases is the way to start being deliberate about how we teach. — Everyone possesses implicit biases, even those whose job it is to be impartial. It’s just a normal part of the brain. — We tend to hold implicit biases that favor our own group, though that is not necessarily the case. — Implicit biases can change. Once we identify some of our implicit biases, we can actually unlearn them. We as educators must not only be aware of our own implicit discriminatory beliefs but we need to make extra efforts to unlearn any biases we have so that we a) don’t pass them on to our students; and especially that we b) don’t unknowingly discriminate against any of our students. Study after study has shown us that children of color are relentlessly discriminated against in school, from teachers’ low expectations all the way to the school-to-prison pipeline. Studies also show us that language associated with girls, students with special learning needs, and LGBTQ students is still extremely negative in our schools. 1. Teacher training programs need to be explicit about implicit bias. New teachers entering the classroom should be aware from the very start where their beliefs are and how they originated so they can be as aware as possible of how they may be treating their students unequally. Understanding implicit bias before managing your own classroom could make all the difference in how you go forward in treating your students with equity. 2. Teachers need to not only seek out diverse experiences, but cultivate diverse relationships. Only until we have relationships with those who are different from us can we break down our unconscious prejudices. Before he died, the first ever elected out gay politician, Harvey Milk, insisted that voters would not vote to discriminate against the LGBTQ community if they realized how many of their friends and colleagues were actually LGBTQ. The same goes for all other differences. We may not have grown up knowing any people of different religions than ours, but there are multiple opportunities to cultivate friendships now outside of our own religious communities, or outside of our own ethnic or racial communities. 3. Look for opportunities to show everyone humanely and in a positive light and as contributors to our society. Teachers and schools can get lazy sometimes and wait until February to hail the contributions of Dr. King, or maybe manage to discuss the issues of Native Americans around Columbus Day. We must do more than merely teach periodically about great figures, we must consistently expose every day people who are different from our students in a positive light so that our students grow up critically thinking and challenging their own implicit biases. From issues of refugees, to immigration, to transgender members of our community, our students deserve the opportunity to grow up appreciating everyone, no matter how different we are from each other. Yes, the police across this country need to face their own implicit biases and how that is impacting the constant incidents of brutality and targeting of African Americans. But as Secretary Clinton reminded us, we ALL have to face our own implicit biases if we want to make our country better for everyone. A crucial place for this examination and change to start is with teachers and our schools.